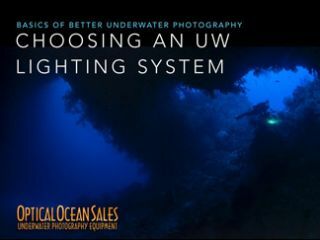 Adding a lighting system can make one of the largest differences for your underwater photography and videos. Over the years many customers have asked for some sort of combination of video light and strobe. With most new cameras also shooting excellent video, this need has increased. However mounting both types of lights at the same type is bulky and heavy. Underwater photographers want to keep their rigs small and compact to swim with. It’s especially so in these days of limited baggage when traveling. When you add in extra batteries and chargers, lighting starts to take up significant space. 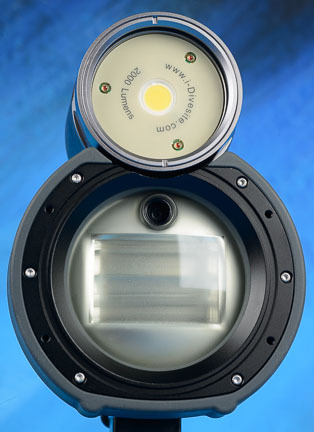 Ikelite first developed the DS-161 strobe with video light, and it met with some popularity as an all-in-one. However the DS-161 is pretty large and heavy, and the low, 500 lumen output of the the “video” light was weak and uneven. 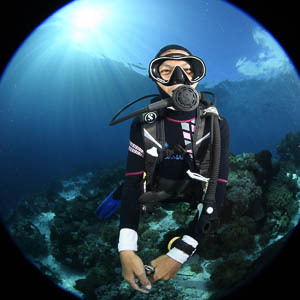 I-Divesite, also known as I-DAS, located in Hong Kong and distributed in Canada by i-Torch, has made underwater lights and arm systems for sometime. 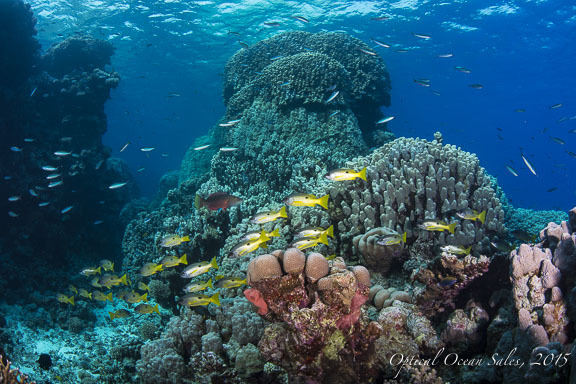 Optical Ocean was one of their first dealers and over the years we’ve seen them develop a wide range of creative and practical underwater lighting ideas. The Symbiosis Lighting System SS-2 and SS-1 are a well thought out implementation of the combination strobe/light idea. But they’ve taken it a long step farther by making the design modular with well-integrated controls and features. Current Symbiosis models are shipping with either a 1000 or 2000 lumen head. Different light heads can be interchanged, and in the near future there will be a wide selection of lights available including 4000 lumen, narrow beam, UV and more. As lighting technology is changing rapidly, photographers can simply upgrade their lights’ heads and not have to replace the entire thing. Same with batteries. The light head and battery can be combined with a (soon to be released) light adapter for a stand-alone light with a convent socket provided to add a mount or handle. Planned also are an optional dome diffuser and a snoot for a more directed strobe light. The specifications of the Symbiosis strobe are impressive and competitive with other strobes and lights. The SS-2 features a guide number of 32 and an energy-rating of 108 watt-seconds, and the SS-1 has a guide number of 24 and 54 watt-seconds. Both have a beam angle of 90 or 100 degrees with a diffuser (that cuts down the power by 1 full-stop). Color temperature on either is 5700K. Having a battery pack gives the strobe a fast recycle time; a full dump takes 1.6 secs on the SS-2 and only .08 sec on the SS-1. However any smaller power setting or auto will be almost instantaneous. When used in the focus light mode with the strobe on as well, the video light head is limited to 2600 lumens of output. What’s nice is that is has an auto off/on trigger so the light won’t show up in your photos. But that can be over-ridden (SS-2 only) and the light be used in fill-in mode as well. The strobes connect with fiber optical sync only. They do not work in TTL, but have two Auto Flash settings; A1 (.5 to 2 meters) and A2 (.2 to .5 meters). Most impressively they have a very adjustable manual control; the SS-2 has 15 steps and the SS-1 has 8 steps. Controls are simple; two knobs one for on/off & mode, one for power level, a button to override the light into video or red light. 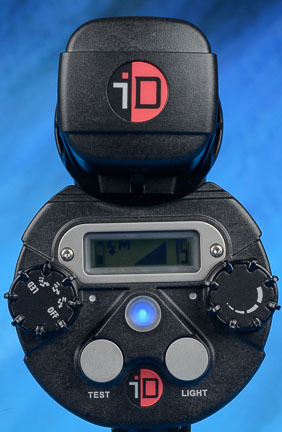 and a test button (something missing from many strobes). The back display is impressive. There’s a mode/strobe recycle light that changes colors depending on the mode or when the store is recharged and on the SS-2, and an LCD display that does much of the work. The LCD display is bright, backlit with fairly large numbers and a display that’s easy to read - even in the dark. What’s even cooler is that the display swivels if you turn the strobe upside down - something I almost always do as I move closer to the subject. No need to re-orient to upside down numbers! The display shows mode/power level, battery remaining and a reminder what mode the light is mode in (white/red/video). 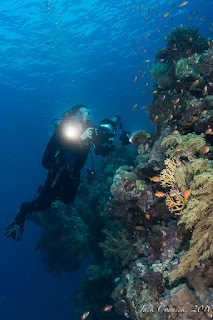 It’s easy to understand and read, something that’s nice on a busy dive at 80’. We tested two prototype SS-2 strobes on our Red Sea Photo Expedition this year. They featured a 4000 lumen light head which we found more than adequate for video use with a GH-4 and 7-14 lens. Color temp was fine and the light bright and even. It was very convent to switch between video and strobe/focus light modes at the push of a button. The nicest improvement was the overall size and ease of use of the rigs; no needing to mount a separate light for video if you want to take both stills and footage! Battery life varies depending on how much, and at what power, you use the LED light. In our testing we found there was more than enough power to use both for a dive or two in mixed usage. If only used as a video light, it lasted one dive. Recharging the battery was easy, just unscrew the battery and plug in the smart charger; it took about an hour and a half in our experience. From a dead state, the specifications say it may take 2.5 hours to fully charge it. I would buy a spare set of batteries and rotate them if you are doing multiple dives. For stills the strobe performed pretty well. Our prototype had only a 24 GN so it seemed a little under-powered when compared with the YS-D1/D2 strobes we were using, and a diffuser was definitely needed - all issues now improved on the shipping version. Recycle was very fast, we never seemed to be waiting for it. We weren’t able to try the auto mode out (due to lack of instructions), but to use it you set the strobe to one of the auto modes, then take a test shot and correct the strobe ev output. It will then automatically adjust itself up or down 8 steps depending on the light that is reflected to the strobe head. As long as the camera settings don’t change, you won’t need to adjust the strobe to get the same exposure. Like many TTL or auto modes, it’s probably most useful for macro or closer-in types of shots. For our use we used manual and adjusted as we needed to. The SS-2 strobe was probably the easiest to adjust manual strobe we’ve used, as you can easily see the ramp of 15 1/3 ev steps on the LCD; no switch detents to click through, or tiny labels to read. 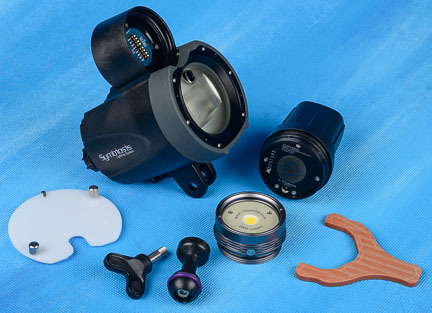 The i-Divesite Symbiosis strobes come in a complete kit with both YS and ball mounts, diffuser, smart charger, spare orings and grease, and a well-written manual. The SS-1 is $599 and the SS-2 is $699. In our evaluation, the $100 difference in price between the SS-1 and SS-2 is well worth it. With the SS-2 you get a more powerful strobe, a much more adjustable output, better features and best of all the LCD display. 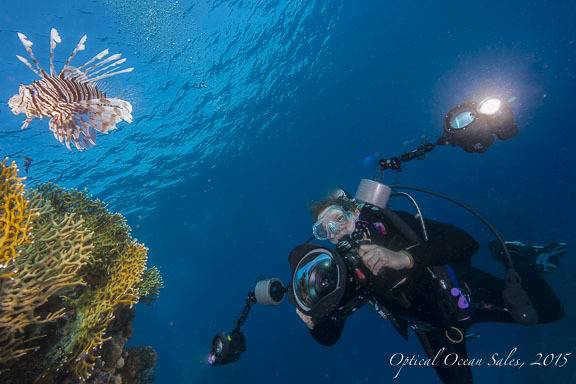 We think the i-Divesite Symbiosis strobes are a creative new underwater lighting product that has a well-engineered combination of features, controls, power with future modular upgrade-ability that make it a great value for photographers.